Picture books may not fall into the young adult classification, but they are an important category of children's literature. Also, I believe many of them eventually led me to gravitate toward the fantasy genre. My love of stories and writing began with picture books. In fact, they are still the books displayed most prominently in my home, the ones I have kept the longest and loved the hardest, and the ones I want to read to my kids one day. 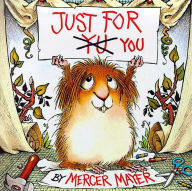 In Mercer Mayer's Just for You, the sweet-hearted Little Critter wants to make life easier for his mom and show her he cares, but despite his best intentions, he can't quite seem to pull it off. From breaking the dishes while putting them away to eating the apple he picked for his mom, the Little Critter can't help but be a kid, make mistakes, and be adorably imperfect. Somehow, he still manages to find a way to show his mom how much he loves her. I love the personality and details in the illustrations of this book. In every picture are a cricket and spider seeming to look over, or even at times help, the eager Little Critter. This book was certainly memorable for me and inspires the imagination. 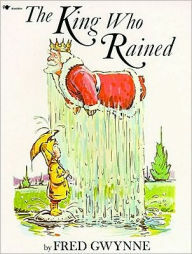 The King Who Rained calls out comical double meanings in the English language that may make kids who are hearing these phrases for the first time raise an eyebrow or two. The "king who rained for forty years" hovers like a cloud in the sky, pouring water. The book's main character, instead of holding her big sister's bridal train at her wedding, holds a locomotive above her head. The "foot prince in the snow" wears tights and a tunic covered with feet. The book invites the kind of playful fascination that comes with discovering new things and questioning the meaning behind them. Things that make language (and being a kid) exciting and, at times, puzzling. Once upon a time...I love many books that start like this, but Princess Furball is so unique and intriguing, it was a staple (pun for The King Who Rained fans?) that I read to my dolls as a kid, and always saved for last. A young princess fleeing an arranged marriage ends up in another land, working as a kitchen maid in a king's castle. She brings with her three trinkets from her departed mother and gowns golden as the sun, silvery as the moon, and glittering as the stars packed in tiny walnut shells, as well as a coat of a thousand furs, which she uses to disguise herself. The three nights that the king holds a ball, the princess wears each of the gowns to escape her disguise and dance with the king. She also leaves the trinkets in the soup she later makes for him in the kitchen. Confused by the trinkets, the king repeatedly asks to see the servant in the coat of furs, until he realizes she is the princess in the gowns of the sun, moon, and stars with whom he has been dancing. It's an enchanting story of a girl who loses love and all she knows, suffers through a painful time, yet manages to keep her spirit and find love again. 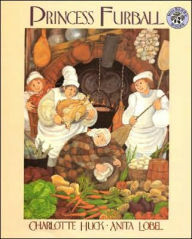 Also, fun fact, the illustrator, Anita Lobel, is the wife of Arnold Lobel, writer and illustrator of the classic Frog and Toad books. Their daughter, Adrianne, is also an artist. And, because I can't help it: a big honorable mention to The Monster at the End of this Book, written by Jon Stone and illustrated by Michael Smollin; Lon Po Po, a Chinese retelling of Little Red Riding Hood, by Ed Young; and The True Story of the 3 Little Pigs, a comic retelling of (you guessed it) The Three Little Pigs, told by Jon Scieszka and illustrated by Lane Smith. What picture books did you love most as a child? Which ones left the most lasting impression on you? This is a great topic. My favorites were: The Runaway Bunny, What to do with a Kangaroo, My Dream Bed, Sometimes I Like to Curl up in a Ball, Goodnight, Moon, and many others. I haven't read any of these books. Like Laurie, I read Corduroy. I also read books like Alice in Bible Land, the Topsy Turby Kingdom, The Princess and the Kiss, and every fairy tale or ancient myth I could get my hands on. Great idea for a post! Thank you for the thoughtful comments, everyone. Laurie and Hannah, I loved Corduroy too. And I loved fairy tales, Hannah! Spruce, Goodnight Moon is a great one. My nieces love it. Thank you for sharing the awesome article! That is such an interesting topic.